Several states filed suit to block sales of downloadable blueprints to use in 3D printers to create the plastic guns. 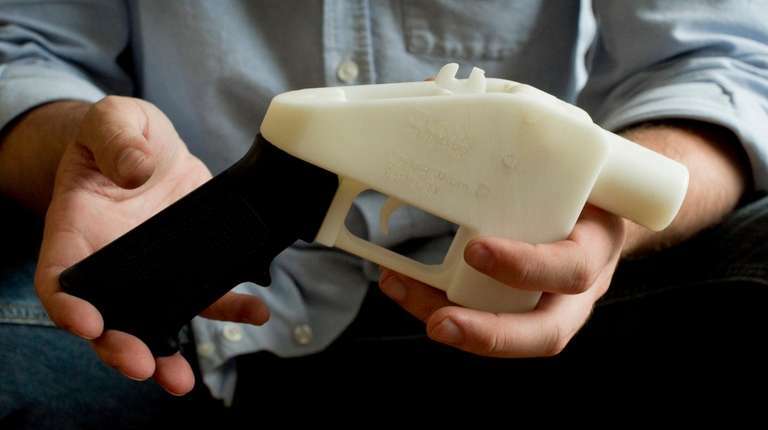 WASHINGTON – A federal judge in Seattle on Tuesday issued a temporary restraining order to block the posting online of blueprints to use 3D printing to make untraceable and undetectable plastic guns — just hours before a website planned to upload the plans. U.S. District Judge Robert Lasnik put a plan by Defense Distributed, an Austin, Texas, company, on hold in a ruling in a lawsuit filed Monday by attorneys general in eight states, including New York and New Jersey, that contends plastic guns pose a national security threat. “There is a possibility of irreparable harm because of the way these guns can be made,” Lasnik said, saying they could end up in the wrong hands. The court took action on the same day that President Donald Trump said he’s looking into his administration’s approval of 3D printable guns, a policy that reverses the Obama administration’s legal battle to block them. Last week, the NRA posted a video on its website in which spokeswoman Dana Loesch opposed banning the 3D printable guns. “What you’re talking about is preventing technology and progression of existing firearm knowledge and tech right now, which never works,” she said. Democrats put the blame for any harm that might come from the printable guns at the feet of Trump and urged Republican lawmakers in passing bills to prevent the company from posting and selling the blueprints on its website. Gov. Andrew M. Cuomo said he will issue a cease-and-desist order, like governors in Pennsylvania and other states, to keep the company from distributing data into New York. “These weapons have no place in our state,” Cuomo said. The guns can be made without a serial number so that they’re not traceable or without a piece of metal carrying a serial number so that they will be set off alarms when going through security screening using a metal detector, said the lawsuit by the state attorneys general. Democrats filed three last-minute bills in Congress Tuesday, but they acknowledged legislation would not be passed in time to stop the company from selling the plastic gun plans. And they acknowledged they had not won support from Republicans, who control Congress. “The idea of these print-on-command ghost guns is every bit as scary as it sounds,” said Senate Minority Leader Chuck Schumer (D-N.Y.). Schumer said Congress will have to pass legislation to stop the home-made guns. The Republicans who control the House and Senate have been resistant to passing most gun restrictions, and have said little about the printable guns. The National Sports Shooting Foundation, the lobby for major gun manufacturers, said the printable guns are expensive and difficult to produce, are not as accurate and fall under the same federal guns laws as conventional firearms. “Criminals have easier, cheaper sources,” the foundation’s fact sheet on 3D guns said. It noted there has been no record of a criminal using a 3D gun. “Criminals obtain their firearms from the black market, theft or associates,” it said. “We do not believe that this technology will have a significant effect on the sale of firearms in the commercial marketplace,” said foundation spokesman Mike Bazinet. Earlier this year, the Trump administration changed the policy when it settled a successful legal battle mounted by the Obama administration against a business called Defense Distributed, which publishes blueprints in the form of design data for 3D printers. The State Department in the Obama administration succeeded in blocking the company from posting the plans online, saying that publication violated export laws that do not allow distribution of firearms to other countries. But the State Department under the Trump administration flipped its position, saying the publication of the gun schematics does not violate the export laws — a move it made, Democratic senators said, without notifying Congress. Attorneys for Defense Distributed had contended all along that the banning of the publication of the gun blueprints violated their First Amendment rights. Defense Distributed’s website offers plastic guns, some with non-detectable metal parts, in the design of AR-15s, AR-10s, a pistol called “Liberator” and a Ruger 10/22. With Michael Gormley and The Associated Press.